Starring Steve Carell, Anne Hathaway, Alan Arkin, Dwayne “The Rock” Johnson, Terrence Stamp, David Koechner, Terry Crews, Masi Oka, Nate Torrence, Patrick Warburton, James Caan, Bill Murray and Bernie Koppel. Screenplay by Tom J. Astle & Matt Ember. Distributed by Warner Brothers Pictures. 110 minutes. Rated PG-13. I went into the theater for the Get Smart movie slightly dreading the experience. After all, Get Smart is my favorite television comedy ever. Nearly every TV show turned into a movie has been a serious disappointment. Most of them have been absolutely dreadful. What are they going to do to ruin Get Smart? 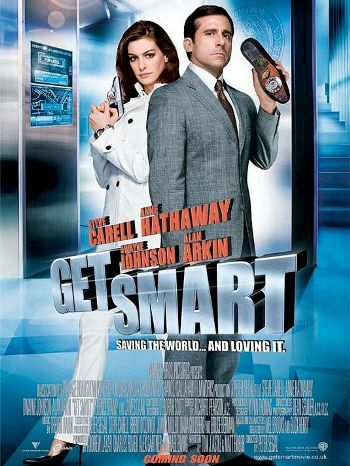 Well, it turns out that while Get Smart isn’t exactly a great film, it was a lot better than I feared it might be. It was a reasonable summer entertainment, sometimes very funny and sometimes not as funny as it wanted to be. It will never make me forget the amazing series it was based on, but it was a nice enough tribute to it. And, thank the Lord, Get Smart is not trolling in the muck with the sorry likes of Bewitched, Starsky & Hutch, I Spy, McHale’s Navy, The Beverly Hillbillies and Charlie’s Angels. The first thing they got right was the cast. I’m not necessarily talking about star Steve Carell, who can be brilliant in his career but also can be rather hit or miss. (Evan Almighty or Dan in Real Life, anyone?) He does do a nice job as Maxwell Smart. He won’t make anyone forget Don Adams in the same role, but he is able to mostly pull off the mixture of seriousness and silliness that is necessary for the part, as well as the inevitable slapstick. However, it was a complete brainstorm to hire Anne Hathaway as Agent 99. She has the perfect mix of all-American sultry looks and comic timing to make the role a complete triumph. Alan Arkin does not really get enough to do as The Chief of CONTROL, however he too is a casting director’s dream. Other brilliant ideas in casting were Patrick Warburton as Hymie the Robot (who gets little to do here, but is set up for a sequel), Terrence Stamp as the head bad guy and David Koechner as an annoying CONTROL agent. Get Smart is full of clever sight gags and grand stunt sequences which make for a quick and fun two hours. On the down side, they do tend to tweak the source material a little too much. This Maxwell Smart is no longer an idiot savant – a force of good who stumbles triumphantly into situations with only his unflagging belief in law and exceptional dumb luck on his side. Instead Smart is a competent if bookish lab tech who has never gotten the chance to live the exciting Agent life simply because he is too valuable behind the scenes. He’s a bit of a klutz but has many skills which suit him well in the field. Thus, Smart may be a more realistic character, but it slightly neuters him as a comic force. The humor also can get a little unnecessarily dumb – a dance sequence with Smart and an obese woman at a European manor comes immediately to mind. However, the pleasant surprise is that the laughs flow a lot more freely and legitimately than we had any right to believe. Get Smart isn’t a great movie, but it missed it by that much. Copyright ©2008 PopEntertainment.com. All rights reserved. Posted: June 20, 2008. Tags: Alan Arkin, Anne Hathaway, Barbara Feldon, Bernie Koppel, bewitched, Bill Murray, Charlie's Angels, Control, Dan in Real Life, david koechner, Don Adams, Dwayne "The Rock" Johnson, Evan Almighty, get smart, I Spy, James Caan, Jay S. Jacobs, Masi Oka, Matt Ember, McHale's Navy., movie review, Nate Torrence, Patrick Warburton, Peter Segal, PopEntertainment.com, Starsky & Hutch, Steve Carell, Terrence Stamp, Terry Crews, The Beverly Hillbillies, The Rock, Tom J. Astle. Bookmark the permalink.